In Australia, low back pain (LBP) is the most frequently seen musculoskeletal condition in general practice and the seventh most frequent reason for consulting a physician[1, 2]. According to the Australian National Health Survey, 21% of Australians reported back pain in 2001; additionally, the Australian Bureau of Statistic's 1998 Survey of Disability, Ageing and Carers estimated that over one million Australians suffer from some form of disability associated with back problems. LBP poses an enormous economic burden to society in countries such as the USA, UK and The Netherlands. In the largest state in Australia, New South Wales, back injuries account for 30% of the cost of workplace injuries, with a gross incurred cost of $229 million in 2002/03. It is expected that most people with an acute episode of LBP will improve rapidly, but a proportion of patients will develop persistent lower levels of pain and disability[5, 6]. Those patients with chronic complaints are responsible for most of the costs. Effective treatment of acute LBP is important because it prevents patients from developing chronic LBP, the stage of LBP that requires costly and more complex treatment. There is a growing concern about effectiveness of treatments for LBP, as reflected in the large number of systematic reviews published in the last 5 years addressing this issue. [7–12]. Despite the large amount of evidence regarding LBP management, a definitive conclusion on which is the most appropriate intervention is not yet available. A comparison of 11 international clinical practice guidelines for the management of LBP showed that the provision of advice and information, together with analgesics and NSAIDs, is the approach consistently recommended for patients with an acute episode. Most guidelines do not recommend specific exercises for acute LBP because trials to date have concluded that it is not more effective than other active treatments, or than inactive or placebo treatments. However, some authors have suggested that the negative results observed in trials of exercises are a consequence of applying the same exercise therapy to heterogeneous groups of patients. [14–16]. This hypothesis has some support from a recent high-quality randomised trial in which treatment based on a diagnostic classification system led to larger reductions in disability and promoted faster return to work in patients with acute LBP than the therapy recommended by the clinical guidelines. In 1981, McKenzie proposed a classification system and a classification-based treatment for LBP labelled Mechanical Diagnosis and Treatment (MDT), or simply McKenzie Method. Of the large number of classification schemes developed in the last 20 years [19–26], the McKenzie Method has the greatest empirical support (e.g. validity, reliability and generalisability) among the systems based on clinical features and therefore seems to be the most promising classification system for implementation in clinical practice. Physiotherapists commonly adopt the McKenzie Method for treating patients with LBP[28, 29]. A survey of 293 physiotherapists in 1994 found that 85% of them perceived the McKenzie Method as moderately to very effective. Nevertheless, a recent systematic review concluded that there is insufficient evidence to evaluate the effectiveness of the McKenzie Method for patients with LBP . 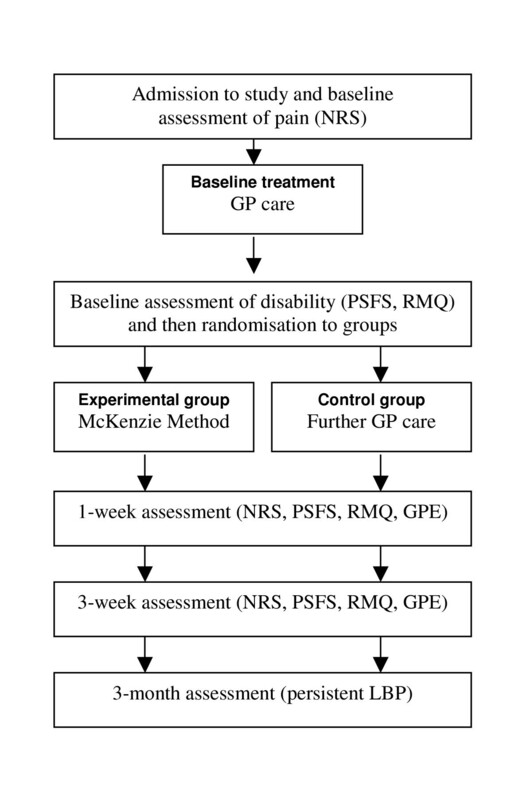 A critical concern is that most trials to date have not implemented the McKenzie Method appropriately. The most common flaw is that all trial participants are given the same intervention regardless of classification, an approach contradictory to the principles of McKenzie therapy. Subjects who volunteer to participate and satisfy the eligibility criteria will receive baseline treatment and then be randomly allocated to one of the study groups. To ensure equal-sized treatment groups, random permuted blocks of 4–8 participants will be used. Randomisation will be stratified by Workcover compensation status. The stratified random allocation schedule will be generated by a person not otherwise involved in recruitment, assessment or treatment of subjects and the randomisation sequence will be placed in sequentially numbered, sealed envelopes. The flow of participants through the study is detailed in Figure 1. Flow of participants through the study. Legend: GP – General practitioner; NRS – Numeric pain rating scale; PSFS – Patient-specific functional scale; RMQ – Roland-Morris questionnaire; GPE – Global perceived effect; LBP – Low back pain. 3. Global perceived effect (0–10 GPE) recorded at 3 weeks. 4. Number of patients reporting persistent back pain at 3 months. Intermittent back pain under prolonged, static end-range postures (usually flexion); no loss of movement, absence of deformity. Patient education and postural correction. Patient adopts the posture that produces their symptoms. Physiotherapist instructs patient how to abolish symptoms by correcting the posture and provides explanation on the mechanism that produces pain of postural origin. Attainment of the corrected posture is taught through the use of the "slouch-overcorrect" exercise. Patients are taught how to maintain the corrected posture through the use of a Lumbar roll and actively when a lumbar roll can-not be used. Consequences of postural neglect are discussed. Intermittent back pain at premature end-range; radiation only in the case of the dysfunction of an adherent nerve root; partial loss of movement. Patient education, postural correction, and stretching of contracted structures. Posture correction and repeated end-range movements towards the direction of dysfunction (e.g. extension exercises for extension dysfunction). Ten to 15 stretches are repeated at 2/3-hourly intervals, until the movement loss is restored. Treatment progression may include clinician overpressure and/or mobilisation. Constant or intermittent back pain and/or leg pain that moves proximally or distally during repeated movements; variable degree of loss of movement; deformity, paraesthesia, numbness and myotomal weakness may be present. A rapid change in the location of symptoms and in the range of movement is seen. Reduction of derangement and maintenance of reduction, recovery of function and prophylaxis. Reduction of derangement is achieved with sustained positions and/or repeated end-range movements. The treatment principle (extension, flexion or lateral) is selected according to the movements that abolish, decrease or centralise symptoms, as well as those that restore mobility and function (e.g. extension principle is adopted when extension centralises symptoms). Patient generated forces are used as the procedure of first choice. The exercises are repeated at home at 2-hourly intervals or as necessary for pain relief. Forces are progressed when the progress plateaus including over-pressures and therapist mobilisation. To ensure the maintenance of the reduction the patient is instructed to avoid aggravating postures or movements. Lumbar supports are used where necessary for the maintenance of lumbar lordosis.